This bar/restaurant has personal meaning for me. It’s one of the locations my girlfriend and I loved in Madrid when we were younger. I’ve been 11 years with her already and still very happy! El Viajero is not only romantic, beautiful, original and well decorated. It’s a terrace, in middle of the vibrant neighbourhood la Latina, which offers you stunning views to the Basílica San Francisco El Grande. 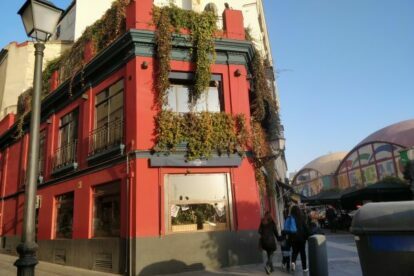 It’s location is perfect for a pit stop, as it’s beside plaza la paja, plaza de los carros and the mercado de la cebada. I think it’s a great plan to tour around la Latina and end up at the terrace of el Viajero at dawn. Take into account this location is pretty popular, so if you don’t like the hassle of waiting or finding yourself with no free tables, you’re better off going another time. The decoration is sublime, and each year it seems to me like it’s improving. They have 2 floors, but I have to admit 90% of the times I go to the terrace. The entrance is a cool bar; the first store is a hipster restaurant done with taste and care, and lastly the terrace above is divine. They’ve filled up the whole place with many plants, providing a fresh feeling in the city center of Madrid. No better feeling than toasting a caña under the sun in a “jungle” and watching the classical beauty of the architecture fused with the noisy activity of this spot.